Home / NEWS / SUA: SHORT COURSE ON ENVIRONMENTAL ASSESSMENT OF VALUE CHAINS START ON 28-30 JAN, 2019. SUA: SHORT COURSE ON ENVIRONMENTAL ASSESSMENT OF VALUE CHAINS START ON 28-30 JAN, 2019. The purpose of the course is to provide decision makers and agribusiness managers with basic knowledge on quantitative environmental sustainability assessment, life cycle assessment and life cycle management. The course will enable decision makers and agribusiness managers to interpret and relate to environmental performance assessment of agribusiness products, services and value chains. 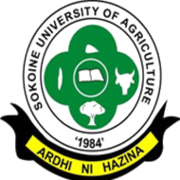 The course is split up in 3 parts: Introduction to quantitative sustainability assessment of agribusiness value chains, introduction to life cycle assessment and introduction to life cycle management. Teaching of the individual topics is supported by exercises and a case study. Apply life cycle thinking when evaluating the environmental performance of agricultural products, services and value chains. The course consists of lectures, group exercises and cases. The participatión fee is Tshs 50,000/= which covers training handouts, breakfast, lunch, and evening tea. Participants will cover their own travel and accommodation expenses. Agricultural Value Chain actors and stakeholders. Postgraduate students are also highly encouraged to apply and attend.